When it comes to actors making appearances at comic conventions, I imagine it takes guts (and some pride swallowing) to sit at a booth, sign pictures from a 30-year-old role, and listen to a bunch of weirdos in costumes talk about their pet ferrets. That being said, I was trying not to act like a tool at Wizard World (a comic convention) today, when I had an opportunity to meet one of my childhood idols, Michael Biehn. For those of you who've never heard of action films, Michael Biehn played Reese in Terminator, Hicks in Aliens, Johnny Ringo in Tombstone... etc. He is, as I would put it, a major dude. He's played a Navy SEAL three times. So as I’m shaking his hand and trying not to be a douche, his girlfriend (Jennifer Blanc, evidently from Party of Five according to the sign) asks to see my glasses, and then puts them on Michael Biehn’s face to see how he would look. 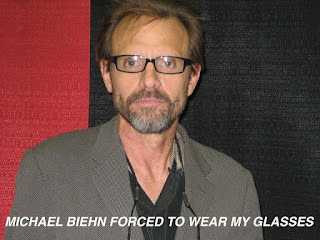 My friend Wade managed to snap a picture of him, and to answer Jennifer’s question: It turns out my glasses make Michael Biehn look pissed off. His characters all have a tendency to die. He dies in Terminator. He dies again in The Abyss. And he dies in Tombstone. I think it’s safe to say that Michael Biehn also wanted to die at Wizard World 2010 today. While I have somehow never been to a Comic Convention, I always imagine it as a place where I could get an answer to a question that instantly came to mind as soon as I read this post. Reese v. Hicks? They either each get their futuristic weapons, or nothing. I think I am going to go with Reese, better fighter, Hicks, better leader. But actually what compelled me to post on this, was to remind you of repeatedly watching the last scene in Aliens on slo-mo with volume off. Then given the dialogue as if Ripley was asking Bishop out on a date right as Bishop gets cut in half by the mother alien. Good times!! !